Case in point: Kraft's new Grilled Cheese flavored, "explosion" line of boxed dinners. The meal itself was edible (but I'm eating mostly stale crackers and ramen noodles so that isn't saying much) and it wasn't until later that I realized they intended this to taste like a grilled cheese sandwich. I can't say I noticed any undertone of grilled cheese and I'm a connoisseur of grilled cheese sandwiches, so if your dream is to eat a pasta version of a grilled cheese sandwich then be prepared to rent a room on Disappointment Avenue. The milk and butter added to the orange powder brought out a bright cheesy aroma and the hint of a dairy cow in a congested stockyard. The parboiled pasta, which I overcooked because I was distracted by my incontinent dog peeing on the kitchen floor, was shorter and fatter, almost like Penne. Mini penne, I might call it if that made any difference to anyone. This pasta dinner is being hawked as "More Cheese Sauce. Bigger Shapes." Both of these are relative terms and basically empty promises...paper hearts on rain-streaked windows...dirty needles in dead grass...etc. Special attention must be brought to the use of the word "Explosion" when used in conjunction with any lactose product. Don't do it! Explosion really only belongs on a bag of popcorn. Anywhere else hints of some future gastro-intestinal calamity. There was nothing explosive about this boxed dinner and that was one of the stronger points of the meal. I don't want explosive food. Can I be more clear that using the word explosive is ill-advised. You might as well use the word "blood" or "scab". It makes no sense even for children. One reason I can't see myself in advertising is it forces associates to justify their existence and their marketing budget with insane promotions that defy any rational or capitalist theory of what people will buy. IF not for marketing failures like this the dinner would cost half as much. So this offensive campaign is actually stealing money from you. Furthermore; Kids don't buy food and parents who buy boxed cheese dinner for their kids probably don't care if the word "explosion" will convince their kid to eat the mini penne covered with viscous artificial cheese paste. And beggars like me who acquire their meals from the food pantry aren't in a position to choose. I found the marketing of this meal atrocious. It was an affront to decency and taste. I'm also an ad whore which means I took special interest in the mysterious and unusual box cover illustration. Correct me if I am wrong but what I'm seeing is a cheese shaped dinosaur (or is that dinosaur shaped cheese?) getting splashed with a tsunami of cheese. His left paw/hand is held out in surprise and something akin to amusement. His mouth opens in a slightly angst-ridden grimace. It could be a smile, an ear to ear grin. I can almost hear him say, "Aw guys, you got me again! Doused with Cheese! Har har har." The dinosaur has teeth that would make Reese Witherspoon jealous, not the jagged predator teeth that a T-Rex actually had in his gullet. And this cheese dinosaur has his frog-like eyes closed. He seems to be enjoying the dousing. Maybe it is a highly evolved frog. I don't know. It is nameless* and made of artificial cheese. It is an anonymous cheese frog/dinosaur hybrid drowning in sauce. And it has white polka dots as some pseudo-camouflage adaptation. How insane! *Actually, a little research tells me this brand mascot is called "Cheesasaurus Rex", something that just rolls off my tongue like encephalitis. I predict this one will go extinct much faster than the real dinosaurs and it won't take an asteroid either. Awful, is the only way to describe the marketing team's choice in mascots. Unoriginal and awful. What the hell kind of emotional reaction is this image supposed to elicit? Well, the box says to "have some cheesy fun with these cheesy flavors." Oh, really? By getting drowned in artificial cheese? Or by menacing innocent dinosaurs with my cheesy projectile vomit? It looks like the dinosaur's right arm has been absorbed by the cheese wave. Or maybe the dinosaur is actually being materialized before our eyes...he is evolving like the pasta shapes, from a reptilian form to a Godzilla poised to traffic despair and wrath on the villages of Japan. Another image I get is in Terminator II, when the T-1000 played by Robert Patrick is tossed in molten metal and melts. This box really asks the question: Are we being born or are we dying? It's kind of a half empty/half full debate to identify your personality type via cheese dinners. I see the dinosaur as succumbing to a torrent of liquid cheese. But another more positive individual might see this as a resurrection of a wounded dinosaur meeting his element head on and gaining strength and confidence. Which are you? 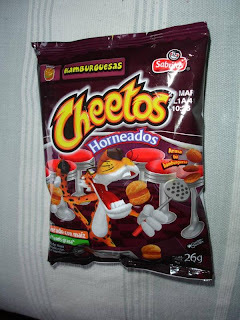 Below is the Latino equivalent, Cheetos that taste like hamburgers...as long as you eat them with a hamburger. Let it be known that Mexico is the home of the fish taco but America reigns as king of Hamburgers. This is an abomination but at least the Cheetah mascot is related to the name "Cheetos". What does a polka dot dinosaur have to do with macaroni and cheese?